i asked for the engraving to read R.L-H. but they put R.L.-H. This classic platinum wedding band is a great choice if he wants a narrow band. 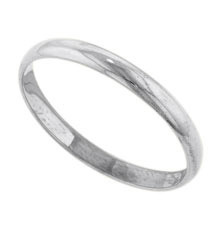 The band measures 2.5 mm wide and 1.1 mm high and has a very comfortable fit.